Mount Merapi in Indonesia began erupting on October 25 (2010), causing 38 deaths including the "gatekeeper" of 220 years. 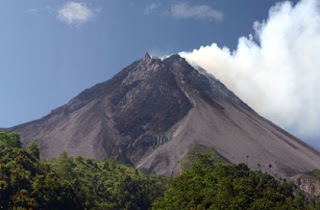 Merapi is a dangerous and heavily monitored volcano, with a long history of eruptions. It builds domes which collapse, effuses lava flows, pyroclastic flows and lahars. It has been argued that a major eruption in 1006 AD weakened the Mataram civilization of Central Java, causing it to move from Central to East Java (see summary of 10,000 years of Merapi history in Newhall et al., Journal of Volcanology and Geothermal Research, v. 100, Issues 1-4, pp. 9-50, 2000). A distinguishing feature of Merapi, shown in the photo to the left, is a "somma", an opening in the summit to the southwest. Such "sommas" usually indicate that a flank of the volcano has collapsed; the "amphitheater" at Mount St. Helens that opens to the north is such a feature. Hard evidence for the collapse such as obvious avalanche deposits has not been found and so the somma itself is the best evidence for this process. Eruptions in the 20th-21st century have been rather mild, and less explosive than those for which the field evidence suggests occurred between the 7-19th centuries A.D. Dome collapse producing pyroclastic flows is so characteristic of this volcano that this style of eruption has been called "Merapi-type" at volcanoes over the world. Volcanologists suspect that the 20th century "mild" activity of Merapi is just an interlude between larger events typical of the past record. Precursors of such an event are not known, resulting in a dangerous situation for the hundreds of thousands of people who now live around the volcano. 80,000-100,000 live inside"The Forbidden Zone", an area of about 10 km radius on the south west side. Several hundred thousand more live just outside this zone. Volcanologists work with the populace to come to an understanding that prediction is not an exact science, that there will be false alarms, but that risk management is a necessary public good. A documentation of historical eruptions between 1768-1998 is available in Voight et al., Journal of Volcanology and Geothermal Research, volume 100, issues 1-4, pp. 69-138, 2000.